Similan Islands are a unique marine paradise that is considered to be one of the top liveaboard diving destination in the world offering some of the most spectacular diving in Thailand. Similan Islands Liveaboard Diving: In the midst of the Indian Ocean, to the west coast of Thailand – South Andaman Sea, lies The Similan Islands and Surin National Marine Parks. This group of islands is considered to be one of the top Liveaboard diving destinations in Thailand and in the world. The isolated location coupled with the maritime influence from the Indian Ocean allows the Similan archipelago to be blessed with an exceptional diversity and abundance of marine life. Surin & Similan Islands cover an area of 140 km2 including Ko Bon, Shark Fin Reef, Ko Tachai and Richelieu Rock. Most of the islands are uninhabited. This is the perfect place for Liveaboard diving holidays. During your Similan Islands Liveaboard diving vacation in Thailand, you will discover a myriad of experiences, activities, breathtaking white beaches and scattered magnificent boulders. However, the most outstanding scenes are found under the waves including spectacular coral growth and very rich marine life including many of the most exciting larger pelagics such as Manta Ray and Whale Sharks, making the islands the ideal playground for all scuba divers. Important information concerning Liveaboard diving in Similan & Surin National Parks regulations. Dear customers, kindly acknowledge the recent changes for Surin & Similan Liveaboard diving activities. The decision comes from the Thai National Marine Park Authorities, and is applicable to past, present and future bookings. The number of entry tickets to National Parks of Similan and Surin is now limited to 525 tickets daily for scuba diving. This includes Liveaboard and day-trips alike. The entry tickets will be linked to the name, passport number and operator and will not be refundable, nor subject to change to another name or date. Due to new regulations, we advise you to book your Similan Islands Liveaboard holidays at least 60 days in advance. All customers must possess a Scuba diving accident and evacuation Insurance, and must provide Insuring company name, policy number and contract number. If customers cannot show proof of coverage, they will need to purchase the Premium Diving Insurance for 220 baht/ day from All 4 Diving. Customers without insurance will not be able to join the trip, and there will be no refund. Single use plastic bags are no longer allowed to take to the Similan & Surin National Parks. It is not possible with overnight stay at Similan Islands. It is not possible to book bungalows or stay at the camping sites. Scuba diving Phuket – Phuket Island with its international airport is the main gateway for your Similan Islands Liveaboard diving holidays and is 90 minutes drive away from Similans. With us, you will find both daily dive trips and multi-day Similan Liveaboard diving itinerary. Similan Islands Liveaboard diving with All 4 Diving is your dive & cruise holiday partner in Thailand. With us, you will find the best Similan liveaboards diving deals, including Surin National Marine Park, Koh Bon, Koh Tachai and the famous Richelieu Rock dive site. For more than 20 years, All 4 Diving is the specialist of Similan Islands Liveaboard diving trips. Our exclusive selection of liveaboard vessels cover all the Similan Islands dive sites and we can match your needs to one of our top notch liveaboards exclusive selection. Many different vessel levels of comfort are available on the market and it is sometimes not easy to do the good choice. It is why we have exclusively selected the best Liveaboard boats on the market with four main criteria; safety, comfort, service, and price. In the budget Liveaboard category, you will get the best deals for your Similan Liveaboard diving holidays in Thailand. The twin, triple or quad shared cabins will be useful and clean with for most of them windows open on the ocean, the staff is highly experienced and the atmosphere fun and warm. The entire shared bathroom has all the necessary conditioner, shampoo, and soap. The freshly cooked food is prepared by long time employed chef and the crew will take care that nothing is missing for your own comfort. Economic means only affordable price for your Similan Islands Liveaboard diving holiday with valuable quality and high safety standards. You will go diving on the same dive spots that the five stars Liveaboard vessels, surrounded by tropical islands, warm blue waters, and a friendly crew. Flexible, economic and comfortable Twin Boats. Samboon 3 dives around the Similan every day of the week except Mondays and Thursdays when she goes up to Surin Island and Richelieu Rock for the day. Samboon 4 dives around the Similan every day of the week except Wednesdays and Sundays when she goes up to Surin Island, Richelieu Rock, Koh Tachai and Koh Bon for the day. 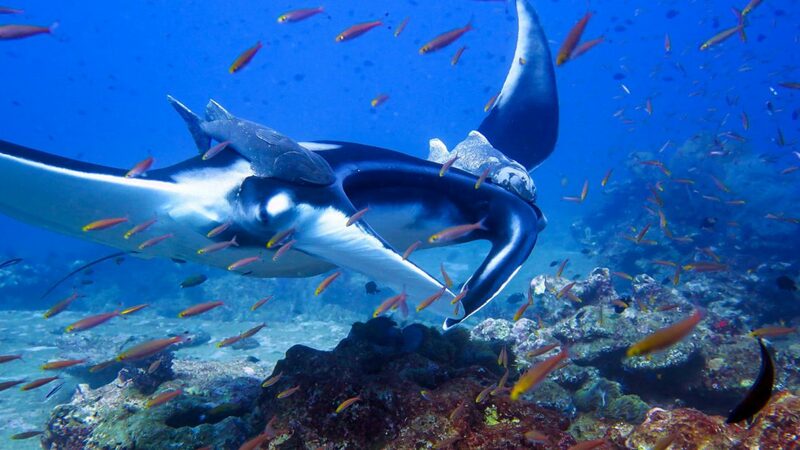 Manta Queen 2 is the best value 3 days – 3 nights dive & cruise holiday program that you can find in Thailand. She doesn´t cruise at Similan Islands, but she concentrates at the essential – the most interesting dives at Ko Bon, Ko Tachai and the famous Richelieu Rock. Your chances to dive with Manta Rays and Whale Sharks are real with this liveaboard diving program. Nitrox Available. Manta Queen 3 is our best seller and the flagship of Manta Queen fleet. The M/V Manta Queen 3 is one of our more affordable Similan Islands Liveaboard diving vessels which was a custom build launched in 2011. The cabins all feature air-conditioning, windows/portholes. The vessel features a spacious outdoor dining area, saloon with LCD TV/DVD, large sun deck with shaded area, and a spacious dive deck. Nitrox is also available on board for a small fee. Why not enjoy your next Similan Islands Liveaboard diving holiday in a comfort class vessel? All 4 Diving Phuket, rich of more than 20 years experience in the south Thailand Liveaboard diving market, has selected for you the best comfort class Liveaboard boats. Every boat in the comfort category has been fully inspected to be sure that high safety standard is respected. All the crew and staff on board is highly concerned by your diving holidays at Similan Islands and they will make sure that your journey on board will get your full satisfaction. All cabins follow the Europeans standards with nice decoration, in-room cleaning service, and air condition. You will be delighted every day by the western and Thai food that the Chef will prepare for you with passion. Each boat has spacious saloon facility to give you the advantage and to enjoy the best Similan Islands Liveaboard diving holiday as well as relaxing on a 5 stars service and vessel. Welcome on board MV Pawara, a First class custom built, steel hull, Similan Islands Liveaboard vessel. Refitted especially for this season, she is now equipped with large hull stabilizers and improved keel for maximum comfort at sea. Enjoy fully serviced dive trips and first class facilities including 24h A/C rooms, FREE NITROX!, traditional Thai style decoration, comfortable living area and entertainment facilities including flat screen TV, DVD player and WiFi in selected areas! Experience a real adventure of 5 or 7 Days Liveaboard diving with the famous and authentic “The Junk – June Hong Chian Lee”. Step aboard The Junk and spend your Similan Islands Liveaboard diving holiday with her to the most fantastic diving sites around Phuket and the Similans and you will get your best liveaboard diving vacation ever! She is famous for her high standard of service and serving the best 5-star food you have ever had on a diving liveaboard. Similan Islands and Burma Liveaboard. MV Deep Andaman Queen yacht is a well designed Liveaboard boat with superior comfort and built in 2012. She has air-conditioned spacious cabins with private bathroom. She has a variety of cabin configurations to suit our guests’ requirement from a quad, triple and twin shared standard cabins on the lower deck, to Deluxe Double bed and Twin beds cabins on the main deck. Combine your dive & cruise holiday with a stay on a high-class Similan Islands Liveaboard diving vessel. It is possible with All 4 Diving Phuket and his Superior class selection of Liveaboards cruising in around amazing tropical islands of the Andaman Sea. You will be surrounded by crystal clear turquoise waters and will enjoy the unforgettable lagoons and sunsets of Thailand. On board, the crew will always be available to assist you all the time and ensure that your Liveaboard diving vacation will be the best you have ever had. You will sleep in high-class level cabins, fully equipped with Air condition and fans and all necessary features for your comfort. The Chef will cook delicious western and Asian food, as well as other international dishes. If you have a special requirement, just ask and they will do their best to organize for you. You will never forget your Similan Islands Liveaboard diving holiday with All 4 Diving when going on a Superior class Liveaboard vessels selected by us. MV Sawasdee Fasai Liveaboard is a large and luxurious purpose-built Similan Islands Liveaboard boat, and the newest addition to the Similans fleet. With a solid steel hull and air-conditioned en-suite cabins, guests are guaranteed to enjoy safe and comfortable 4 days and 4 nights dive cruises at Thailand’s best dive sites around the Similan Islands, Ko Bon, Ko Tachai and the famous Richelieu Rock. With 35 meters in length, the MV Hallelujah is by far one of the largest Similan Islands Liveaboard boat cruising in the Similans. Her all steel construction makes her safe and smooth, promising a relaxing ride throughout your trip. Each of her cabins features its own sink, toilet, hot shower and air-conditioning for the ultimate in privacy, comfort, and convenience. She is one of the favorite vessels in the Superior class Liveaboards! MV DiveRACE Class E’s design was conceptualized with the help of a team of naval architects and Dutch vessel consultant. She is constructed following international standards closely, with the aim of being a high-class liveaboard diving vessel of excellent quality, providing the best for each passenger on board during trips. Luxury boutique scuba diving and sailing cruises in the Similans and the Mergui Archipelago – Burma departing from Phuket in Thailand. Diva Andaman offers outstanding journeys into the romantic past of the early 20th century, aboard a classic wood sailing yacht. During the tour, you will be delighted by the beauty of the dive sites and islands of the Andaman Sea, while indulging yourself with a fine Thai, Asian and international cuisines. 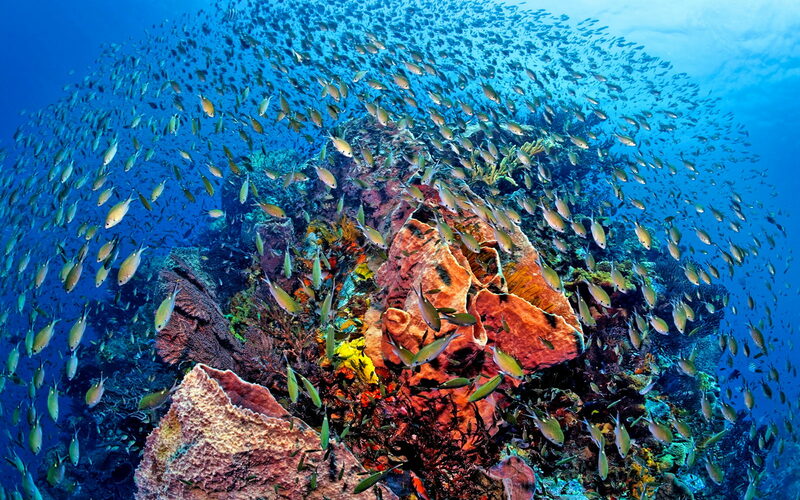 The underwater topography of Similan Islands differs between the eastern and western sides of the islands. In general, the east facing dive sites feature gently sloping reefs and drop-offs with impressive gardens of sea anemones, flourishing hard and soft corals, and teeming fish populations. With negligible currents and mostly moderate depths, these dive sites are suitable for almost any level of diver. The sheltered conditions are ideal for scuba divers. The western side of Similan Islands is quite the opposite. Here giant boulders tumble down to the seabed in depths of more than 40m. Currents have kept the gaps between the boulders free from build-ups of sand, leading to the development of tunnels, arch-ways, and caverns that provide exciting swim-throughs. The currents also provide nutrients for masses of gorgonians, crinoids, sea fans and lush soft corals. The season for Liveaboard diving in Similan, Koh Bon, Koh Tachai and Richelieu Rock begins in November and ends the first week of May. The rest of the year, Similan Islands are closed to Liveaboard diving activities. During March and April, Thailand’s hottest period, Liveaboard diving in Similan and Surin Islands are the most exciting as the sea temperatures cause plankton blooms, which attracts a wealth of the larger animals into the area. Going for a Liveaboard diving in Similan during this period results in chance encounters with amongst others, schooling chevron barracuda, giant trevally, rainbow runners and reef sharks. There’s also a selection of rays including eagle, marbled and enormous but graceful Manta Ray. With dive spots, such a Koh Bon, Koh Tachai and Richelieu Rock, Similan Liveaboard diving holiday in Thailand is a fantastic adventure. With All 4 Diving, your Similan Islands Liveaboard diving holidays will be the most amazing and unforgettable in Thailand.